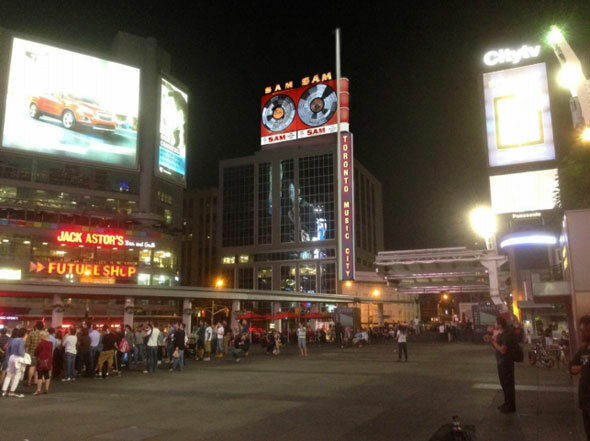 After years of political wrangling, the Sam the Record Man sign is finally getting a new home at Yonge-Dundas Square. City council voted this morning to have the sign reassembled on the roof of 277 Victoria Street, a city-owned building on the east side of the square, and have Ryerson University pick up the bill. The decision means Ryerson is no longer responsible for installing the sign on the outside of the new Student Learning Centre at Yonge and Gould, the original site of the Sam the Record Man store, despite building permission being granted on the understanding the university would restore the giant neon records in situ or on the outside of its library. Ryerson claimed the sign would clash with their architectural designs, distract students, and pose a safety risk due to the presence of mercury in the old bulbs. "We always thought there was a better solution than that," said Sheldon Levy, outgoing President and Vice Chancellor of Ryerson University, last year. "There was a number of people, ourselves included, that thought we could find a better location. We were always willing to meet the obligation of putting it on Gould Street, that was never the question." Ryerson will pay the cost of installing, operating, and maintaining the sign in Yonge-Dundas Square. The gigantic sign was built in 1961 for the exterior of Sam Sniderman's flagship Toronto record store. Today, only one store from the original music store empire remains in Belleville, Ont. Musicians Geddy Lee and Leslie Feist wrote letters urging for the sign's return prior to today's decision. The sign is currently in pieces at a sign company in Vaughan. The city looked at various location in Yonge-Dundas Square, including the northwest corner of Yonge and Dundas and the roof of a smaller building beside to 277 Victoria. Today's decision also directed city staff to seek funding sources for a "Toronto Music City" sign. City council also voted to ensure that any future owner of the Victoria Street building, which is seen as a prime target for redevelopment, must take on the preservation of the sign. City staff noted that tethering the sign to the building will reduce the value of the property should it be sold at a later date. Are you pleased with the outcome?